Myers Towing was founded in 1986 by Father and Son, Vernon and Hurshel Myers. Today, three generations of the Myers Family work daily to serve customers all over California. Myers Towing has four locations across Northern California including Hayward, Tracy, Modesto, and Turlock. We have one of the largest fleets of trucks in California stationed between the Bay Area and Central Valley, servicing an expansive area for our customers. Myers Towing has provided services to over 18 law enforcement, government, and transportation organizations in Alameda, San Joaquin, Stanislaus, and Merced Counties for over 30 years. Our specialties include: providing quick response times, dedicated equipment, trained and certified operators, electronic dispatching, towing, storage and management programs that serve local municipalities, and the motoring public in an economically efficient, safe and reliable manner. 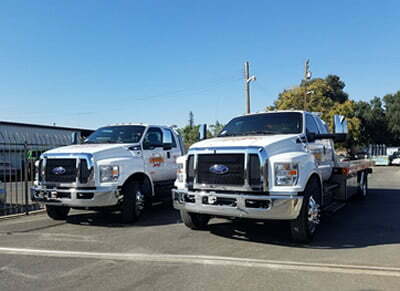 Myers Towing is a contractor for Freeway Service Patrol program, a roving fleet of tow trucks that provide emergency road clearance, towing, tire changes, fuel delivery and other services free of charge on designated Interstates across California during peak commute times. This program is funded by state and local public funding and provides a valuable service to relieve traffic congestion and prevent secondary accidents while promoting public safety. With our customer in mind, we make sure we’re able to cover all bases and help as many people as we possibly can. Myers Towing provides private property impound and vehicle removal service to commercial property owners, residential complexes, and property management companies. Having a vehicle take up valuable parking space for paying customers, incorrectly parking in designated spots, parking in fire lanes, blocking entrances and exits, or just plain abandoned vehicles produce a hazard and liability to the property owner or agent. We specialize in the rapid removal of these vehicles call us to learn more about our Private Property Vehicle Removal Services. Myers Towing offers impound vehicle sales at all four of our locations. With safety in mind, our operators ensure that the working area at every scene and everyone involved are not in danger of any careless mistakes. We go above and beyond the expected. We care for everyone's property as if it were our own. We strongly believe in providing speedy, proficient service, while always abiding by the most rigorous guidelines of safety in the towing industry. We hold our values high and will accept nothing but the best to be able to provide you with superior service.